Comtrend’s gateways with Fine Point’s ACS will now provide Service Providers with new tools to resolve technical issues, strategically analyze network traffic, and identify opportunities to provide additional revenue-generating services. Irvine CA—Comtrend, a leader in advanced networking solutions, announced today its partnership with Fine Point Technologies (Fine Point), a leading provider of software tools for the management of the Internet of Things (IoT). The gateway and software combination create a new powerhouse solution. Using the TR-069 standard, Service Providers gain better remote management of their gateways, as well as new visibility and problem-solving capabilities with customers’ home and office networks. The emergence of the IoT has sped the development of server and gateway software, built on the technical specification TR-069. Today, the original purpose of TR-069 has been met and greatly exceeded. Now the collaboration of Comtrend and Fine Point allows Service Providers to mitigate or prevent truck rolls, gather valuable analytical data and address the changing demands of broadband service in homes and businesses. The number of connected devices is growing exponentially, including wireless connectivity issues. Comtrend’s gateways, paired with Fine Point’s ACS, not only allow automated provisioning and remote upgrades, but provide unique tools to gain insight into the usage patterns and network configurations within increasingly connected homes. Fine Point’s ACS delivers analytical data, creates visibility into the home network and enables “virtual truck rolls.” These help to reduce costs, increase customer satisfaction, and upsell premium services. Speed Test: Accurately measure customers’ actual delivered bandwidth. Complaints related to slow speed are often the result of bottlenecks within the local network. Being able to remotely identify where network issues reside enable CSRs to transform such complaints into upselling opportunities. Signal Strength Tool: Determine if slow WiFi is an overall issue with the gateway or just a specific device. Signal strength is displayed in both –dBm as well as a percentage of full strength to assist customer service in problem-solving weak WiFi performance. Statistics and Performance Monitoring Tool: Performance reports can be easily generated for use in identifying customers who qualify for higher bandwidth services (i.e. a high number of LANs). Proactively monitor line statistics such as SNR and attenuation. LAN Side Per-Device Data Consumption: View how much data is used both downstream and upstream of each individual LAN side device for better analysis of usage trends and statistics. With local and hosted options, Fine Point’s ACS allows Service Providers to deploy at their own speed, and in some cases, can simply upgrade certain Comtrend gateway models already in the field. Service Providers have a new ACS solution that can create a new, competitive edge with their customers. Comtrend and Fine Point, together, deliver more information, analysis, and problem-solving controls than ever before. 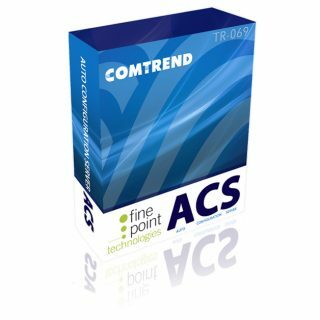 Fine Point’s ACS is now available. Please contact Comtrend or visit www.comtrend.com for any further information. About Fine Point Technologies, Inc.